Persuasion is the art of convincing people to do what you think it best and making them like the idea. How do you do it without sounding like a huckster? Persuasion isn’t just about how long or how much you can speak and wear down your listeners to finally give in– it’s about moving your audience to do something. How do you persuade someone? We always expect something to come after the word “convince” or “persuade.” We want to convince someone to do something. We want to persuade someone to believe or act in a certain way. There you have it. That’s the difference between a public speaker and a two-year old’s public tantrum. Rhetoric – the art of persuasion – is undoubtedly as old as speaking. I’m sure that it wasn’t just the ancient Greeks who studied the methods of persuasion, but we tend to use their words in English to describe the ways we approach our audience to convince them – with facts, emotions, and logic. Watch the Oxyclean commercial and see how it’s done. How effective are facts alone? Facts are not persuasive by themselves. We lose the power of a fact when it’s not put into context. We have to relate the facts to the overall story. Story may be the key to producing a persuasive speech. People don’t remember facts, figures, or statistics. They will remember a good story. Persuasive speeches are hard to write. They take time to craft and practice. For the first time you give this project, I might suggest that you pick a topic that is fairly innocuous – not one that people are going to become offended by. A topic that they’re open to considering allows you to concentrate on the skills you’re working to develop, not so much on the arguments that you’ll have to answer. A humorous topic or something about your community might be a gentle place to start. You don’t have to go full bore and argue about legalizing this or criminalizing that. Go easy on yourself. A few rhetorical tricks that can help you be more persuasive. The classic “rhetorical question” opens a speech in a way that can draw your audience into your speech. When you ask a question that you don’t really expect a response to, you can create a sense of curiosity in your listeners. Don’t you think so? Another good rhetorical technique is the repeating things three times. Now, this shouldn’t be an exact repeat over and over. It’s more like starting a sentence the same way but changing the end. President Kennedy used the phrase “Let both sides” start three sentences in his inaugural address in 1961. It reinforces a message to the audience. Learn to use the long pause. If you were writing out your speech, you might put in an ellipsis or start a new paragraph… to show the audience how important what you said was, and the equal importance of what is to follow. You don’t have to sound… like… William Shatner. But pauses help you by letting your audience catch up, or take a moment to think about what you’ve just said. If you want to see an amazing example of a persuasive presentation, take a look at this Youtube video. This guy has amazing presentation skills! 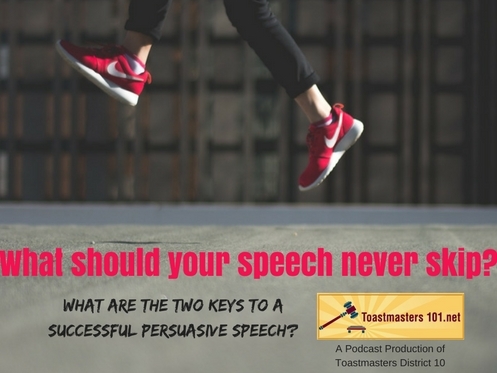 What are the two keys to a successful persuasive speech? Make sure your call to action is clear, concise, simple and specific. Use a personal story that will hook your audience with strong emotions that directly links to the problem you address and the call to action you give.